Social Media Investigator - Direct Insight Services INC.
Social media profile research is an excellent way to research a person’s online public activity. So many people enjoy self-aggrandizing. We are experts in social media research and online profiling. 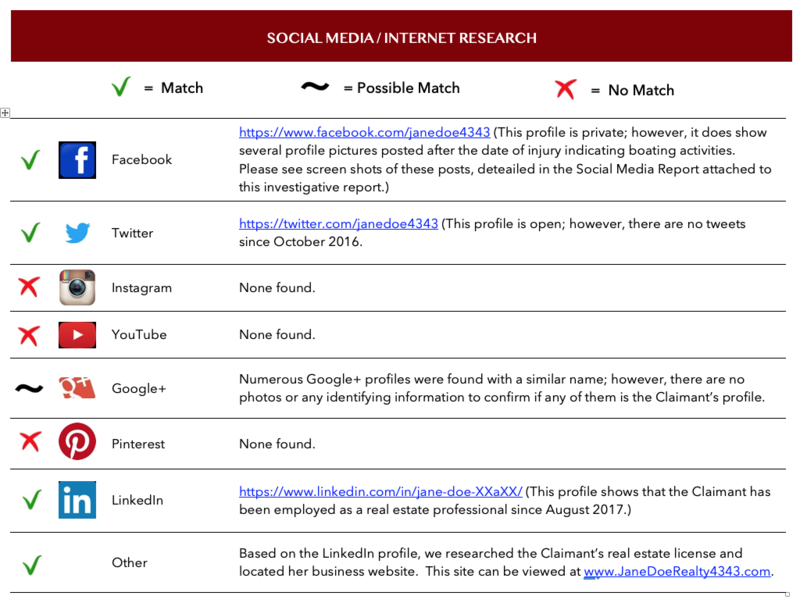 If it’s been posted or if a subject has an account on one or multiple social media platforms we will research it, find it, take screen shots of photos and posts, and report those findings to you. This type of data mining gives us a very good insight into a claimant’s or subject’s interests, hobbies and ultimately their activity level. We use this and all the information to craft up a custom strategy of “how to” investigate a given subject. No investigation is the same. Each is its own unique puzzle with a wide array of variables that change from person to person, from regions to neighborhoods to occupations to hobbies and many, many more. We take into account and analyze as many factors as possible during the initial stage of the investigation or pre-investigation. Yes, BEFORE we deploy a field investigator and spend valuable surveillance time. We profile each and every subject or claimant. It is very common that a claimant will post many contradicting things for all to see online. People love to show off their new toys, boats, jet skis, and snow skis. And they post pictures of them using and playing hard on those toys! Also, injured workers are sometimes caught cheating the system because they boast about having second jobs. Again, we know where and how to look for these factoids. Old, removed, deleted, cached details – they think they’re gone, and we find them! We cross-reference relatives – moms, dads, kids – to get that one detail, comment, or photo contradicting their claims of injury. We find it!